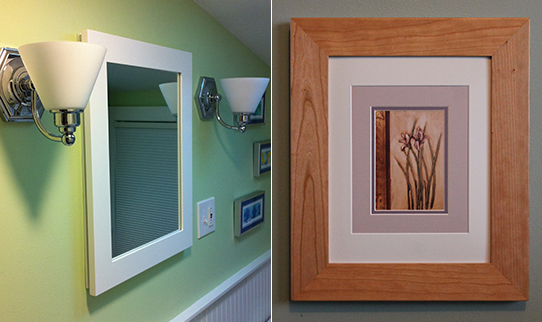 Choose your hidden medicine cabinet with a mirror or hide your medicine cabinet behind a door that you can mount your own photo or artwork in. To open it you simply pull on the frame. Order yours in any of 5 sizes and 4 depths; custom sizes also available. Our cherry medicine cabinets are finished with a natural oil and clear satin finish. Our hard maple medicine cabinets are finished only with a clear satin finish. Our painted cabinets are built from Poplar in your choice of 56 Milk paint colors or any one of 3,645 Benjamin Moore colors in your choice of sheen too! Our red oak medicine cabinets come in a traditional Golden Pecan stain. 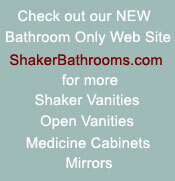 Our white oak medicine cabinets come in 9 beautiful stains (scroll down to see). Options: Order yours with an art/photo door, or with a mirror. Mirrors are very high quality; a full ¼" thick with no bevel. You even have your choice of a 2 1/2" wide shaker frame or a 2 1/2" wide traditional mitered frame. You also have your choice of a left or right hand door. 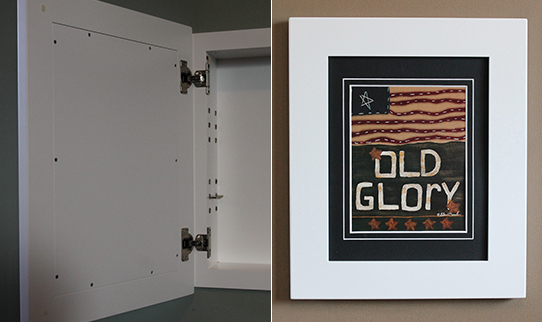 Our concealed medicine cabinets come in your choice of 3-3/4", 4", 5-3/4", or 6" deep. NOTE: Prices shown below are full price. However, only 50% is due at time of order with the balance due when your item is ready to ship. Shipping is 10% of the price with a minimum of $40. Step 2: If you chose white oak above, choose your stain color below, otherwise scroll down to Step 3. If you chose a painted finish above, choose your paint color below, otherwise scroll down to Step 5. Select the Benjamin Moore Option at left and then enter the Benjamin Moore color number and color name in Step 10 below. If needed, visit the MyPerfectColor web site to help you pick out that perfect color you are looking for. If you chose the Benjamin Moore paint option above, please also enter the Benjamin Moore color number and color name below. If needed, visit the MyPerfectColor web site to help you pick out that perfect color you are looking for. Or if you prefer, call us at 603-860-9377 and we will be happy to take your order over the phone and answer any questions that you may have.